The best way to predict the future is to create it and lasers are beginning to offer some interesting alternatives in dentistry. Lasers constitute “cutting-edge” technology which can be used to help detect dental disease in its earliest stages, find tumors and perform both surgical and non-surgical procedures on the soft tissues of the mouth. And they do it with less pain and bleeding. They can even prepare small cavities for fillings by vaporizing decay often without a shot of anesthesia (numbing the teeth), or a drill. Since May 1960 when Theodore Maiman demonstrated the first working laser at Hughes Research Laboratories, laser technology has spawned a multi-billion dollar industry. Lasers now affect everyday life and are in widespread use: in optical storage devices (which store computer data); spectrometers (which by color analysis detect and identify even the tiniest particles from tumors to explosives); CD and DVD players in personal computers and even bar code readers in your supermarket use laser technology. Lasers are used industrially for steel cutting; by the military for target identification and illumination for weapons delivery. And of course lasers today are used extensively in medicine for ophthalmology (eyes), internal surgery, dermatology (skin) and oral health to name but a few applications. What Really is a Laser? Today at the dawn of the 21st century there are a variety of dental uses for lasers, from diagnosing cavities to the removal of gum and tooth structure to treat disease. Dental laser procedures are minimally invasive and can result in less tissue removal, less bleeding and less discomfort for patients after surgery. But what really is a laser? The word “laser” is an acronym for “Light Amplification by Stimulated Emission of Radiation.” Lasers produce an intense and narrow beam of light of one single wavelength. Ordinary “white” sunlight by contrast, is a continuum of light of many wavelengths corresponding to the colors of the visible spectrum or rainbow, plus the infrared (heat) and ultraviolet wavelengths that sandwich them. Sunlight passing through a prism separates into its component colors; laser lights however are a single color. To try to put it simply, a medical laser device includes: a source of electricity; mirrors to direct the beam; a crystal, gas, or set of semiconductors that when stimulated emit specific wavelengths of light, and fiber-optics that deliver the light energy. When used for medical diagnostics or procedures, the material that produces the light determines the specific wavelength properties of the laser and therefore what it can do in the human body. 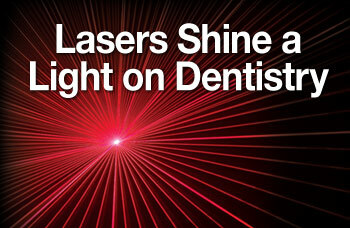 Lasers have revolutionized medicine and now they're beginning to blaze a new trail in dentistry. Since the Food and Drug Administration (FDA) first granted marketing clearance for soft tissue surgery in 1991, the acceptance and use of lasers for dental procedures has continued to blossom. Dental laser usage falls roughly into three categories: disease diagnosis; soft tissue procedures (gums, lip and tongue) and hard tissue procedures (enamel, dentin or bone). The first use of dental lasers was for soft tissue treatment — certain types of gum and other soft tissue plastic surgery (reshaping procedures), biopsies (tissue testing) and more recently removal of benign and malignant lesions. This was followed by the approval of the first hard tissue applications (in 1997), such as decay removal and cavity preparation of enamel and dentin of the teeth. More recently they have been approved for bone re-contouring around the teeth and jaws. The most recent FDA clearance involves the use of lasers for the detection of both disease and health in tissues. Dental lasers were introduced soon after their use as medical devices. In the 1990s, improvements in the pulsing of lasers and fiber-optic delivery systems created an upsurge in general dentists' usage of laser technology. According to a survey published by the American Dental Association in 2000, less than 10 percent of dentists surveyed were using lasers; that number has continued to rise. Predicted in a 2002 survey of dentists, indications were that after a year or more, 14 percent of dentists planned to purchase a laser for hard tissue and 10 percent for soft tissue applications. Each year more dentists obtain training and education in laser use and with this training, the number of dentists who offer laser treatment to their patients continues to grow.